Boston whale watching is the ideal outing, as the city of Boston might not be the first place you think of for whale watching, but talk to anyone who has experienced one of these wonderful tours or talk to one of the many scientists who have planted themselves in the area to study these amazing creatures and you will be pleasantly surprised. Once you board the boat and get a sense of the adventure about to begin, you will not be disappointed. Boston has many research facilities in and around the city that study the amazing sea life in the area and the Boston area whale population is no exception to this. Whales can be found at various times of the year making bold and dramatic splashes from the sea. From our tour vessel, you will have ample opportunity to experience these amazing moments as well as take home some amazing photos. The snapshots you take home may provide years of memories of this amazing experience. Our catamarans feature three outdoor viewing decks so you get on a tour with more space to stretch out, get outside and truly enjoy the experience. Most of our tours are between late spring and early fall, when the whether in Boston is most comfortable and the whales are about and ready to show off for wonderful moments of Boston whale watching memories. Weekday tours run once a day during the spring and fall and usually two times a day in the summer. Weekend Boston whale watching tours run twice a day during the spring and fall and three or more times during peak weekends in the summer and on holidays. 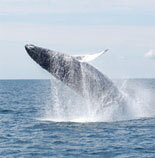 Boston whale watching tours will give you an opportunity to have an up close look at the whales in our harbor. Our tours are also narrated by professional scientists and researchers who have the exciting privilege of also giving Boston whale watching tours in their spare time. Some of the types of whales you can expect to see include humpback whales, finback whales, minke whales and white sided dolphins. Although you may not see all four of these types of whales on a single trip, it is always surprising how many of these creatures like to come out and play for an audience. The humpback whales are particularly spectacular to see due to their size and amazing reach when they plunge upward from the water. Other whales from the native species can be equally exciting to witness in their playful jumps from the water. Whale watching is popular in many continents and in many parts of the world. There are often specific times of years that whales are more visible than others. One of the wonderful things about Boston whale watching is to be on the water with the backdrop of the amazing city of Boston while being so close to one of nature's most amazing species of creatures. You will certainly not be disappointed should you find your way to Boston and have an opportunity go on a Boston whale watching tour as part of your visit to our amazing and historic city. Boston Whale Watching is sure to delight all ages!